The Monsterpocalypse is now fully upon us! Monsterpocalypse was released at the beginning of October with starters for the two agendas and blisters to support the two factions that launched the game. These products allowed players to get their first taste of the game and play a full 1-vs.-1 monster game, but as more products are released for the game, the experience of playing Monsterpocalypse gets deeper and deeper. This edition of the game was fine-tuned to offer the most fun in a 2-vs.-2 monster game. The level of tactical decision-making and resource management when fighting with two monsters provides a player with tons of interesting choices, but the game never drags. The second wave of releases in October made that level of play possible, and from that point on, players could play the game as we envisioned it, allowing them to see all of the interesting choices presented during force construction. With the release of the building blisters this month, the core experience of Monsterpocalypse continues to expand. When constructing a force, not only do you choose a monster and a number of units based on how many monsters are in your force, but you also must bring six to twelve buildings. 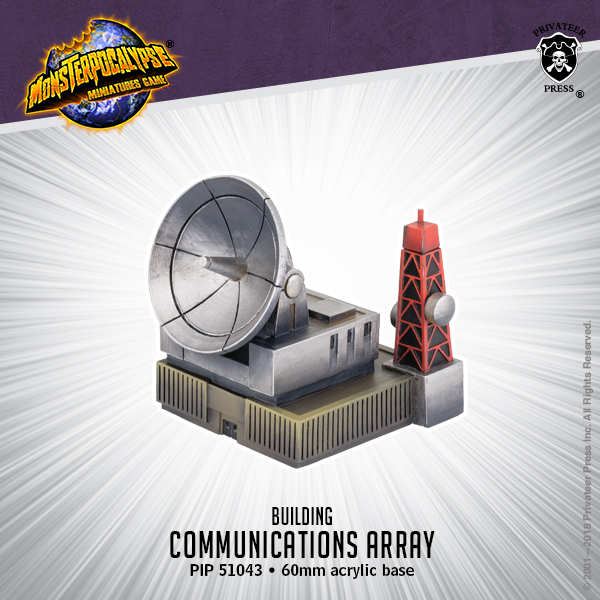 At their most basic level, the buildings in the game are scenery, but not just any scenery. In a standard war game, trees or walls on the battlefield would force the opposing armies to maneuver certain ways. 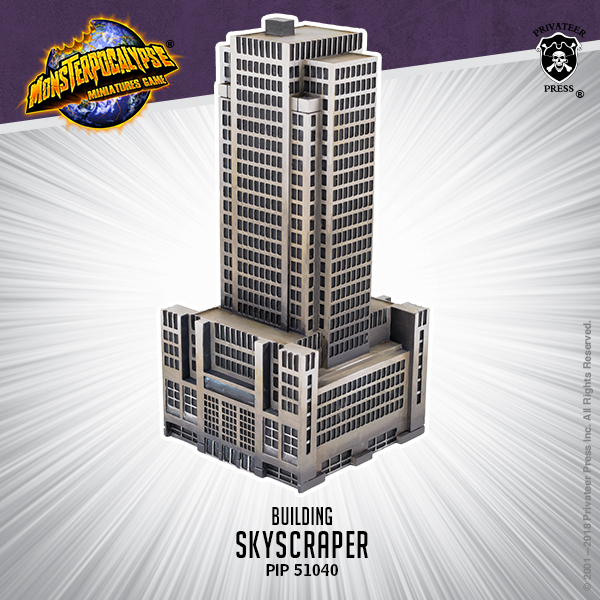 In Monsterpocalypse, the buildings get in the way—until you knock them down. And just knocking down a building, while sometimes necessary, is never as much fun as throwing your opponent’s monster into that same building. In this way, the buildings become the key way monsters can do significant damage and make the positioning in the game very important. Players who have tried the game with the Apartment Buildings from the starters will have experienced this level of the game, but there is a lot more to the buildings than just this. When a map is set up, the players take turns placing their buildings on it. This is very important because in addition to everything mentioned so far, most buildings offer special rules to the force that controls them. Unlike the other models you bring to a game, the buildings you put on the map aren’t inherently controlled by either player. The force that secures a building controls it, and to secure a building, you must have three units adjacent to it and no enemies adjacent to it. So, when placing your Industrial Complex, for example, you have to decide: are you are going to put it in relative safety on your own side of the map, secure it, and gain the bonus speed it offers, or do you have a different plan entirely? Clever placement of building, coupled with aggressive area control, can ensure your force gets multiple extra abilities. Be careful, however, as you’ll also have to guard against your opponent stomping across the map and wrecking your carefully constructed base. Of course, the best defense in a game of Monsterpocalypse is a good offense. Over the next few months, more monsters and buildings that tie directly into the existing factions will be released, but why wait? Monsterpocalypse is available now, and with this month’s building releases, the game has never been so much fun! If you haven’t had a chance to check out what Monsterpocalypse OP events are in store, you can find Crush Hour right here, and the narrative league here. Don’t wait; go check in with your LGS and see when Monsterpocalypse events are being held near you, and then get ready to reach out and crush someone!